You can eat the whole apple. Americans could be throwing away $13.2 billion. What do you think an apple core is? What's the thing we throw away? It is a ghost. If you eat your apples whole, you are a hero to this ghost. If you do not, you are barely alive. Come experience vitality. Earlier this year, in "How to Eat Apples Like a Boss," a video by Foodbeast, the Internet was promised the gift of confidence in apple-eating. Elie Ayrouth ate an apple starting at the bottom, proceeding to up to the top, and finishing with a wink to the camera, as bosses do. Eating as such, Foodbeast said, the core "disappears." I do them one better and say that it never existed. The core is a product of society, man. There is a thin fibrous band, smaller in diameter than a pencil and not bad to the taste. 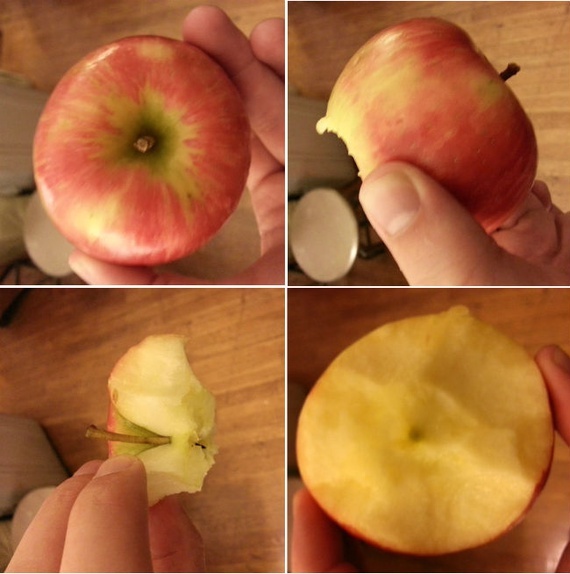 If you eat your apple vertically, it is not noticeable. There are usually a couple seeds toward the top, which are easy to swallow, though it's probably a better idea to spit them because they contain a substance called amygdalin. That can release a small amount of hydrogen cyanide when digested. God/nature wants those seeds on the ground, not in our colons. You would have to eat a ton of apple seeds for it to kill you, but I'm not here to coax you guys into testing your bodies' limits in metabolizing cyanide. I also don't advocate doing anything "like a boss," much less professing it, much less actively aspiring to it by watching YouTube infotorials, but this is an imperative behavioral modification. If you want to feel like a hero by doing essentially nothing, think of it in terms of the national deficit and world hunger. By eating your apples in their entirety, you are a boss in the most endearing sense—not in that the practice confers swagger or panache, but because you are actively part of a meaningful solution. 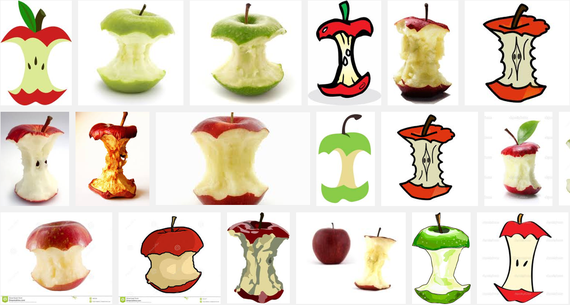 Google image: apple core; see: waste. Don't google apple core myth. They will come for you. If each of us eats an apple a day, as we all do, and we are all wasting 30 percent of our apples at $1.30 per pound, that's about $42 wasted per person per year—which is $13.2 billion annually, thrown in the trash or fed to pigs. With that kind of money, we could rebuild the Gulf Coast after a hurricane the size of Rita or buy an entirely new Mark Zuckerberg. As a health writer I make a point of not trying to tell people how to live their lives. Today I make an exception. This is the cause I will champion to my grave. I was a guest on MSNBC recently to talk about "chicken" nuggets, ostensibly how disturbing they are as a concept, and I endured criticism for being too ambivalent. Eat what you like, in moderation. Chicken nuggets are not my war. On this point I abandon moderation. Bring me on your television programs, and I will eat an apple in its entirety, and I will disparage anyone who does not do the same. As a nation we must redefine apple consumption, lest it define us.